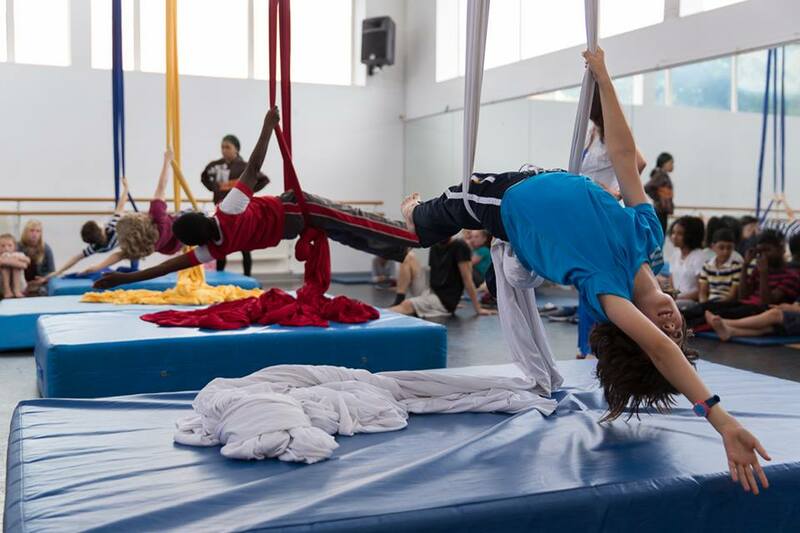 We bring Upswing’s skilled professional artists into schools and colleges to teach circus skills and foster creativity. Our teaching covers a range of forms, from modules for degree level and senior students, to summer schools and one-off workshops, to insightful sessions that support the curriculum by developing confidence and communication skills. With a vision to train the next generation of imaginative, diverse and individual circus artists, Upswing encourages students to think creatively and originally. Our coaching pushes the art form into new areas, allowing it to complement vocational and academic studies. If you’ve seen an Upswing show that you, or your students, love there are opportunities to participate in accompanying activities and even visit the company in rehearsal with your class. To find out more about our bespoke learning programmes, resources for teachers and how to include circus in your lessons contact matthew@upswing.org.uk. Upswing are proud supporters of Arts Award. This accredited framework is designed to help under 25s develop as future artists and arts leaders. By setting participants structured challenges in the art form of their choice, young people are able to gain nationally recognised qualifications, which aid further education and employment. Upswing’s workshops can contribute to Arts Award Discover or Arts Award Explore schemes. Young volunteers can work towards their Arts Award Bronze through training opportunities at Upswing.